Filippo Del Bene was born in Italy and studied Industrial Biotechnology at the university of Bologna. Following an early interest in neurodevelopmental biology, he moved to the laboratory of Prof. Jochen Wittbrodt at the EMBL for his Ph.D. Here, he studied the development of the vertebrate eye and in particular the role of the transcription factor Six3, using the small freshwater fish Medaka as model organism. He continued his work on the development and function of the visual system as postdoctoral fellow in the laboratory of Prof. Herwig Baier at the University of California San Francisco. He investigated the differentiation of eye structures and in particular the neuroretina in zebrafish and started to be interested in neural circuit analysis in this system. In his work, he characterized a new population of neurons in the vertebrate optic tectum that acts as size filter selectors applying optogenetics and calcium imaging approaches. Since 2010 he directs his independent team at the Institute Curie in Paris, where he continues to study the visual system in zebrafish, combining molecular biology, genetics and functional imaging. He has received several awards for academic excellence, including an HFSP fellowships (2005), an Atip/AVENIR starting grant from the French CNRS/INSERM (2010), a Starting Grant from the European Research Council (ERC) in 2012 and the EMBO Young Investigator award in 2014. 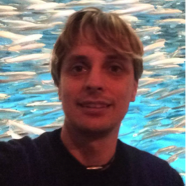 Dr. Filippo Del Bene is mainly interested in the formation and function of the visual system of zebrafish larvae. He focuses his analysis on the zebrafish optic tectum. This midbrain structure has emerged as a optically and genetically accessible visuomotor transformer, which integrates visual and other sensory inputs to produce a behavioral response. He is particularly interested in understanding the function, development and connectivity of a newly characterized class of inhibitory interneurons located in the superficial part of the tectal neuropil named SINs (superficial inhibitory interneurons). His previous work based on functional imaging has placed SINs at the center of a tectal micro-circuit for size tuning of visual stimuli. He is dissecting this working model by analyzing the physiological properties of SINs and their development and connectivity at the level of single synapses by imaging these cells in vivo using fluorescent reporters in transgenic animals. This approach has lead to the recent discovery that SINs play a major role in controlling visually mediated escape behavioral responses in larval zebrafish. At the same time Dr. Filippo Del Bene is interested in the molecular pathways that regulate the assembly of tectal microcircuits during development. Recently, his work has revealed how the secreted protein Reelin controls precise synaptic lamina formation in this brain area. In his studies he applies complementary cellular, genetic and molecular analysis with the ultimate goal to identify the neuronal substrate of visual behaviors.